We recently made a special In-N-Out Burger to prank some friends. In-N-Out is the great Burger chain of the U.S.'s west coast. 1. Tell your friend that In-N-Out recently added Spaghetti Style to their Secret Menu. Act surpised and say it's actually pretty good. 2. When they don't believe you, pull up this picture. 3. Then let them go up to the counter and order Spaghetti Style. Make sure you have your camera out. Or, make your own addition to the Secret Menu. Spaghetti Style: A single Patty, Grilled Onions, Cheese and Marinara Spaghetti. 1. 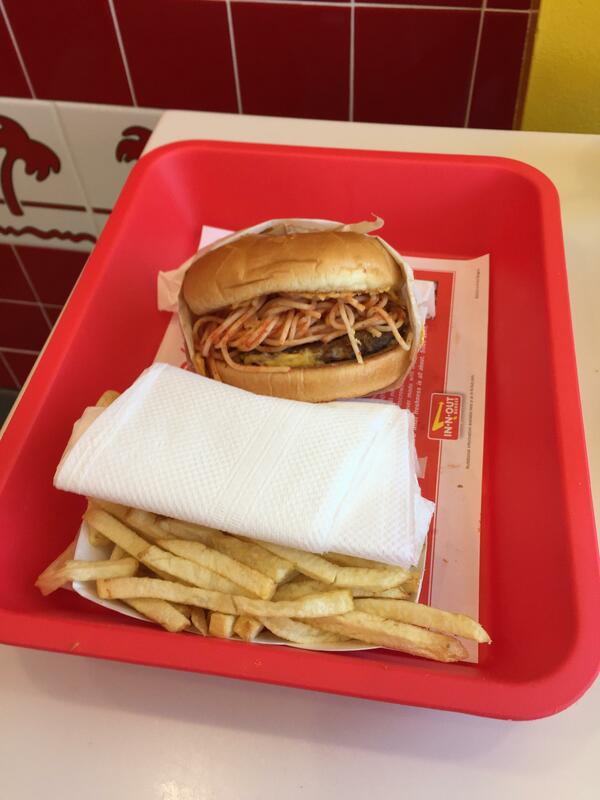 At home, cook whatever you want to add to your In-N-Out Burger. I cooked the most basic pasta dish. 2. Then throw it in some Tupperware and bring it down to Inn-N-Out. I took my burger apart and built the Spaghetti Style myself, carefully putting it together into a believable picture. I got plenty of confused/curious looks from the other customers. If it is slow and you are nice, you may be able to get an In-N-Out employee to add your addition, right as they are making the burger. 4. Prank a friend, eat the evidence and Enjoy. Pranks are really great when you use someone trying to do their job as part of the set up. Hope you don't get someone on a bad day that ends up having just enough of the public. I started the monkey style burger hoax April 1 2014 in Santa Barbara. I duped my entire kitchen staff on April fools day last year, they all came back to me over the next couple weeks, so funny!